THE oil spill in the lower section of the Lee Navigation has been virtually cleaned-up, with the navigation now open. Though Canal & River Trust 'Thank for your patience and cooperation over the last 5 weeks', it is yet another of it's 'Cartisms' as it was the end of January when the oil poured into the Lee Navigation and it was closed—seven weeks ago! 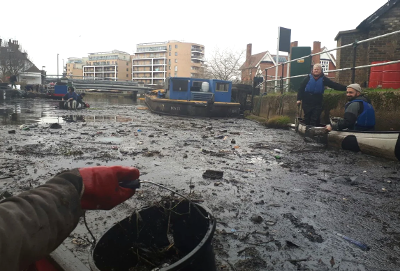 A large quantity of oil was released into the Lee, that caused it closure, with the Trust and the Environment Agency somewhat lax in working to clear it up, Keith Gudgin reminds us. Even now it is not completely cleared with it being admitted that, though the Environment Agency have confirmed it has cleared as much oil as possible, small pockets remain around moored boats, which will be cleaned-up over the coming weeks.